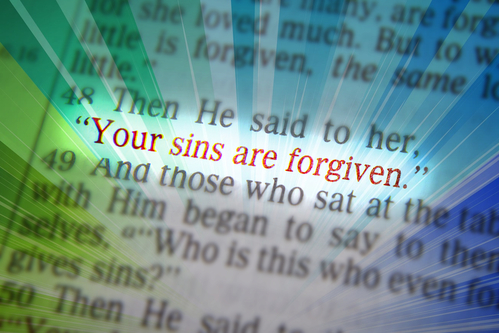 “Through Jesus your sins can be forgiven” (Acts 13:38). Can we really be forgiven, or is forgiveness just a distant dream? Sin is real, which means you can’t get away with breaking the rules forever. But when you are ready to come clean, the Lord is right there waiting for you. It’s never easy to confess your sins, but listen to the invitation God makes in Isaiah 55:7: “Let the wicked forsake his way, and the unrighteous man his thoughts; let him return to the Lord, that he may have compassion on him, and to our God, for he will abundantly pardon.” Maybe you don’t like that word “wicked” or the word “unrighteous.” Maybe that sounds harsh to you. But that’s God’s description of the whole human race. That’s what we are apart from God’s grace. Don’t get hung up on the negative words and miss the invitation. Turn to the Lord, and you will find mercy and pardon. God removes our sins as far as the east is from the west (Psalm 103:12). God puts our sins behind his back (Isaiah 38:17). God blots out our sins like a thick cloud (Isaiah 44:22). God forgets our sins and remembers them no more (Jeremiah 31:34). God buries our sins in the depths of the sea (Micah 7:19). When God forgives our sins, he chooses to forget them forever. Our sins are removed, buried, and blotted out. They can never condemn us again. But how could God forgive us? Why ­doesn’t he look at or remember our sins? A long time ago God fixed his gaze on the cross of his Son, the Lord Jesus Christ, who bore our sins. When we are honest enough to admit we are wicked and evil, a stream of mercy flows out from the cross of Christ, and our sins are covered by his blood. We discover in one shining moment that with God there is forgiveness. If you admit you are a sinner, you can be forgiven. That’s the promise God made when he sent his Son to save us from our sins. Lord Jesus, may the grace that forgave my sins fill my heart so that I may be quick to forgive others when they sin against me. Amen. Musical bonus: How about a little Southern Gospel music today? Let’s listen to Glory to God in the Highest by Ernie Haase and Signature Sound.